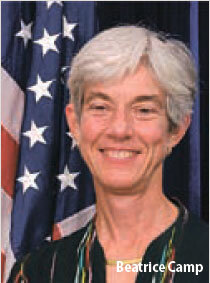 Beatrice Camp arrived in Shanghai last September to serve as the first female US consul-general in the city. Having previously worked in Beijing and Guangzhou - as well as Bangkok, Hungary and Sweden - Camp said she was struck by how much China and Shanghai in particular have changed in the past 25 years. The Albama native, who is now busy working as the US liaison officer for the 2010 World Expo, told Shanghai Star Weekend reporter Emma Sulkowicz why she likes the city's biking culture. Q: So I heard you're something of a biker? A: Yes, my husband and I both like to bicycle on weekends. I brought my folding bike with me, and David bought a matching one because we found you can take them on the subway here. There's a new book by a lady called Yvette Ho Madany about walking tours in the city, so for the last couple of weekends we've been using those routes. You go to one of the places and the book tells you stories about the people who lived there. It really gives you a good feel for the city. Q: You must know more than the locals do. Actually last weekend we were walking towards Fuxing Park and there was a house where, according to the book, the author Guo Moruo once lived. Then two women walked out of it, so we told them what we had heard, and the younger one said, "Really? I didn't know that and I grew up in this house!" You see, the other houses have plaques, but this one didn't. Are you taking your life in your hands riding in Shanghai? A: Well, we've ridden bicycles in other cities like Chiang Mai, Thailand, where I biked to work, and that can definitely be scarier than Shanghai. We also bicycled in Beijing. It's not that bad. The only problem is that it gets hot in the summertime. You just have to understand the bike routes. Last Christmas we were biking home from the consulate, and we decided to follow the route and keep with the flow. It was around rush hour, so we were on this east-west street, and that's when it clicked that that's the way the bikes go. If you take the right road then you're with bikes and no cars. You learn the system and the routes. Shanghai is still - I wouldn't say bike friendly - but it it's not bad. Q: But aren't bikes a welcome alternative to congestion and pollution? A: There is an attitude of the Chinese leaders that bikes are something to get rid of, because they are not modern. The new up-coming generation sees not only the green-ness of bicycles, but also that this is something valuable to the city. It goes along with the whole "Better City, Better Life" theme. One of the things that the expo will feature is called "Urban Best Practices," and the Dutch pavilion will also feature bicycles. The Chinese have such a great tradition of using bicycles but they reject it. On the other hand, America has had a car culture for a long time and we're starting to move away from cars towards bicycles. In general though, many people still have a bicycle and it's one of the reasons I like Shanghai so much.